Mike Misak Chobanian and Vegas Capital Realty specialize in Selling residential and commercial properties, in recent years we successfully helped hundreds of clients with their selling and buying needs. Clients will maximize their Equity also assist home owners that have distressed debt and are under water with Short Sale. 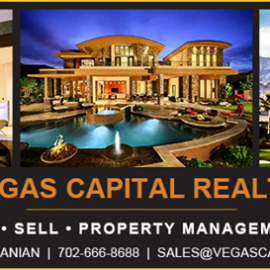 Vegas Capital specializes in helping buyers who are purchasing residential and commercial Real Estate for Owner occupied buyers or Investors. Also helps investors with leasing and managing of their properties. Mike Chobanian and Frank Bruno combined they have over 30 years of experience in the Las Vegas Valley. We help our investors buying an investment property with positive Return on Investment and help manage the property.